Beautiful Incentives: 599Fashion.com brush set & Dollar Store bonus! 599Fashion.com brush set & Dollar Store bonus! While perusing one of my favorite shops, 599fashion, I happened upon a really pretty case of Zebra printed brushes for $5.99. I thought to myself, if they're cheap quality I wouldn't have wasted a lot buying them. Though, I know this company, have purchased from them a lot, and I don't see them selling anything that isn't up to Par. I didn't think I was making much of a gamble and from what I saw close up, they were akin to some brushes I have purchased from ELF's studio line. Another place I absolutely love. Well, upon arrival, I realized I was right. They are JUST like the studio line brushes from ELF. Namely, the stipple and kabuki brushes. Very soft to the touch, white, with a black tip, and minimal shedding. I think one piece fell off the entire time I used them. I'm really not the type to splurge on brushes. Granted, i've never used a $20 dollar brush and I could be converted to the dark side, but the cheaper brushes seem to work fine for me. Not ALL cheap brushes mind you, i've had my share of horrible ones, but a few places have nice ones. 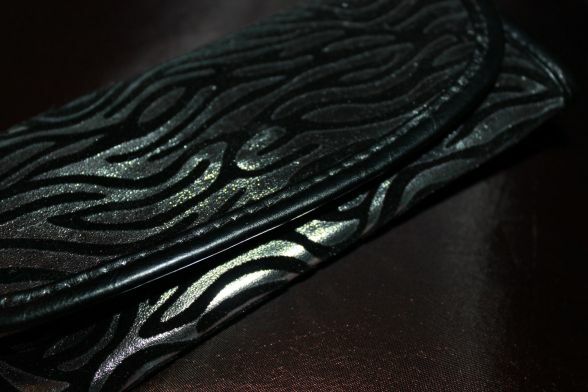 The case is really nice and very durable from what I feel and see. The brushes themselves look like they will hold up well, but only time will tell. I am very impressed with these. Usually a case alone is more than the full price of both. First I tested the thinnest and smallest of the brush set to thinly line my eyelids with an orange hue.The color reminds me of a sunset, so pretty. I have to preface that I am not usually one to wear bright colors on my face or in my clothes when I go out, (Unless it's for Halloween or for photography purposes) but I am starting to get into it in a subtle way. I chose this color as the focal color that closely matched the top I was wearing. (Also from 599fashion!) Then, I used a yellowy orange, almost gold, for the second line on top. I followed up with a lighter shade of the first orange on top of that. Then, I added just a bit of the second color to the bottom of my lower lash lid. The pallets I used are from ELF and an Ebay store. I've had it forever. Both are nicely pigmented, as you can see, and the brushes were easy to apply with. These colors were fun to work with and I think i'll be trying out more bright colors in the future, in a more intricate fashion. 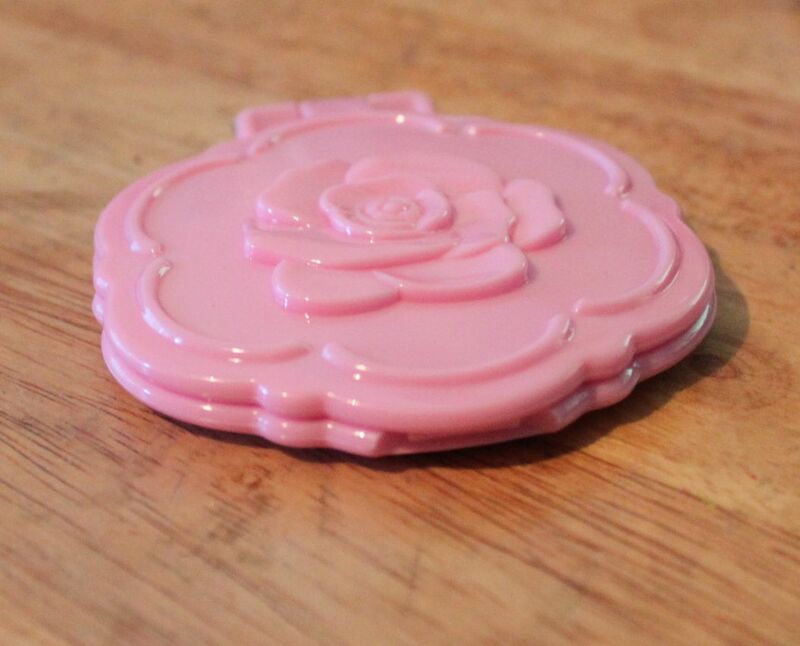 Another cute steal I wanted to share with you was this compact mirror from my local Dollar Tree. How lovely is this? 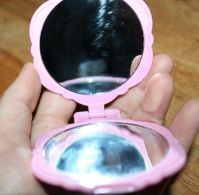 There are two mirrors inside. One is regular and one is for closeup touches. I thought this was a really nice steal for just a dollar. I love the throw back 50's look to it. Back then it was all about pink and flowers. I might need to go buy backups, but it seems like the hinge is pretty tightly screwed and it won't give any time soon. These would make a nice addition to any beauty gift! 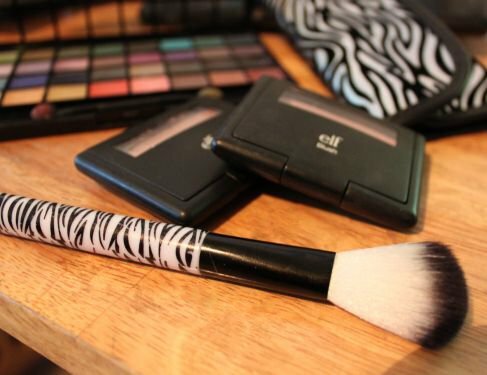 ohh I LOVE the zebra brushes! And it does look like they worked great! Awesome find!! I love those brushes! Sad that they aren't around anymore, but I learned about a new place to shop for cool stuff like them, 599Fashion.com. Thanks! Those look awesome and I want some now! They look great Ali! 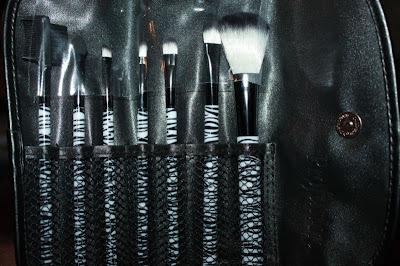 I love the zebra brushes! The brushes seem like they work great! I need new brushes too! I love this brush set! So pretty. The Zebra print is adorable. I am a makeup brush junkie :) These would look great in my collection. I love these, they are cheap enough that I can buy a set for my niece and myself so when she is over we can do make up together without fighting over things! I really, really need new brushes and haven't made up my mind where I am going to buy them from yet so this has really given me another option, I am going to check them out!! I'm not the biggest makeup wearer but those brushes but these are tempting really badly. Wow what a great price for such cute products! I'm going to have to check these out I'm always in the market for some new cosmetics brushes!